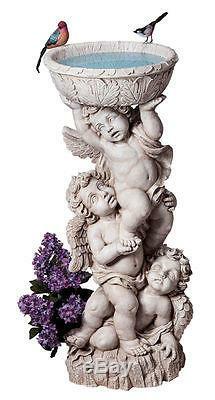 Baby Angel Sculpture In The Baroque Style Trio Cherubs with Urn Garden Statue. Sculpted after an Italian antique. Resculpted from an Italian antique angel sculpture in the Baroque style, this trio of cherubs rises in three-dimensional, perfectly scaled unison to hold up a generous acanthus-ringed urn. This exclusive baby angel garden statue speaks a warm welcome while holding greenery, flowers or water for a classical birdbath. Our cherub statue is cast in quality designer resin and hand-painted one piece at a time. Tracking Information Will Be Provided. We know it's NO fun if your item gets lost or damaged. We Appreciate All Of Our Customers And We Want You To Enjoy Your Shopping Experience With Us. The item "Baby Angel Sculpture In The Baroque Style Trio Cherubs with Urn Garden Statue" is in sale since Wednesday, February 15, 2017. This item is in the category "Home & Garden\Yard, Garden & Outdoor Living\Bird & Wildlife Accessories\Birdbaths". The seller is "gknz" and is located in Owings Mills, Maryland. This item can be shipped to United States, Canada, United Kingdom, Denmark, Romania, Slovakia, Bulgaria, Czech republic, Finland, Hungary, Latvia, Lithuania, Malta, Estonia, Australia, Greece, Portugal, Cyprus, Slovenia, Japan, China, Sweden, South Korea, Indonesia, Taiwan, South africa, Thailand, Belgium, France, Hong Kong, Ireland, Netherlands, Poland, Spain, Italy, Germany, Austria, Israel, Mexico, New Zealand, Philippines, Singapore, Switzerland, Norway, Saudi arabia, Ukraine, United arab emirates, Qatar, Kuwait, Bahrain, Croatia, Malaysia, Brazil, Chile, Colombia, Costa rica, Panama, Trinidad and tobago, Guatemala, Honduras, Jamaica, Antigua and barbuda, Aruba, Belize, Dominica, Grenada, Saint kitts and nevis, Saint lucia, Montserrat, Turks and caicos islands, Barbados, Bangladesh, Bermuda, Brunei darussalam, Bolivia, Ecuador, Egypt, French guiana, Guernsey, Gibraltar, Guadeloupe, Iceland, Jersey, Jordan, Cambodia, Cayman islands, Liechtenstein, Sri lanka, Luxembourg, Monaco, Macao, Martinique, Maldives, Nicaragua, Oman, Peru, Pakistan, Paraguay, Reunion, Bahamas, Viet nam.